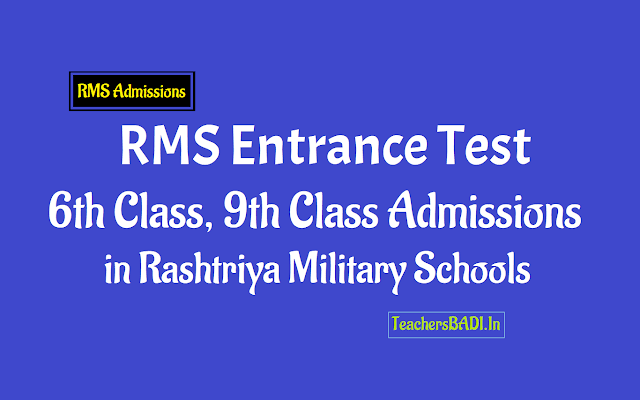 Rashtriya Military Schools Admissions through RMS Entrance Test 2018: Rashtriya Military Schools Entrance Test for Admission into Class VI and IX, Rashtriya Military Schools (RMS) Admissions 2018, Rashtriya Military Schools - Admission to class VI & IX and Last date is 15.11.2018). Applications are invited for admission to class VI & IX in Rashtriya Military Schools located at Chail (Himachal Pradesh), Ajmer (Rajasthan), Belgaum (Karnataka), Bengaluru (Karnataka) and Dholpur (Rajasthan). Entrance Examination: The Common Entrance Test (CET) for admission to Class VI & IX will be held on 30.12.2018. The exam will be based on automated OMR. Age: Only boys aged between 10-11 years as on 01.07.2019 for admission to Class VI and boys aged between 13-14 years as on 01.07.2019 for Class IX. Education: For Class VI, No previous education qualification is mandatory. For class IX, candidate should have passed Class VIII from a govt/ recognized school before the date of admission. Students studying in Class VIII are also eligible to appear in the entrance test for class IX. Medical: Selected candidates will have to undergo medical exam at Military Hospitals. Application Forms: Prospectus and Application forms can be obtained by hand from any of the Rashtriya Military Schools by paying Rs 600 through Cash/ DD. Prospectus and Application form can also be obtained through post by forwarding self addressed slip and Rs 650 through Demand Draft payable at respective Rashtriya Military School. RMS Admissions: The schools old motto, 'Play the Game' was replaced with 'Sheelem Param Bhushanam' which means Character is the Highest Virtue. On 25th June, 2007, the schools got their present name "Rashtriya Military School". The school has several of its alumni occupying high positions in the Armed Forces and in other sectors doing stellar service to the motherland. Rashtriya Military Schools located at Bangalore, Belgaum (Karnataka) Ajmer, Dholpur ( Rajasthan) and Chail ( Himachal Pradesh ) Invite applications for admission to Class VI. RMSs are CBSE affiliated, fully residential public schools, which function under the aegis of Ministry of Defence. Admission Notification has been issued by Rashtriya Military Schools of India for admission into class VI and IX for the academic Session 2019-20 through entrance entrance test and RMSs invite applications from the eligible students. For admission to class VI, No previous education qualification is mandatory. For admission to IX, a candidate should have passed Class VIII from a government or recognized school before the date of admission to a Rashtriya Military School. However, students in class VIII are also eligible to appear in the entrance test for class IX. The Common Entrance Test(CET) for admission to class VI will be held on 30-12-2018 (Sunday). The exam will be automated OMR based in subjects of Intelligence, General Knowledge, Mathematics and English of Class V standard. This Common Entrance Test(CET) for admission to class VI will laso be held on 30-12-2018 (Sunday). The exam will be automated OMR based in subjects of Hindi, Science, Social Studies, Mathematics and English of Class VIII standard. Applications Forms: Prospectus and Application forms can be obtained from any of the Rashtriya Military Schools by paying Rs 350/-( Rs 175/- in case of SC/ST , copy of the Caste certificate to be submitted). Applicants to forward self address envelope of size 31 cm x 25 cm affixed with Rs 60/- stamps for Prospectus and application form along with Demand Draft for the amount payable at respective Rashtriya Military School ( in favour of " Principal , Rashtriya Military School") All applications will only routed through Rashtriya Military Schools. All details pertaining to list of Exam Centers etc are given in the Application form. Acquiring top engineering colleges in New Delhi is no longer a hiking task as there is in-depth information obtainable in a lot of offline and on the internet resources. As New Delhi is the nationwide funds of India, creating your job with its colleges can positively improve your forthcoming clients.